There are lists in this book. There are monsters in this book. There is an exclusive prep school in this book. There are missing parents in this book. Same old, same old….but wait, there is ALSO the legend of Charlemagne and his Paladins wreaking havoc with intent to destroy just about everything; there is the prep school in WISCONSIN of all places which deprives the central character of all his media devices after he arrives because (I love this…. ), and I quote Ajay (a fellow student), “I wouldn’t argue, Will, but I don’t make the rules. And honestly, after a while you’ll find that face-to-face communication works entirely to your personal benefit…’ unquote; there is Dave, the Guardian Angel who died in the Viet Nam War and now is on duty for Will West, the main character. Yes, Will had an unusual route to arrive at the Center for Integrated Learning, and what he sees after his father disappears and his Mom is oddly NOT HIS MOM, keeps him on his toes. The storyline is very similar to Rick Riordan’s Percy Jackson series with a little more depth and darker. Will’s fellow students are both good and bad. 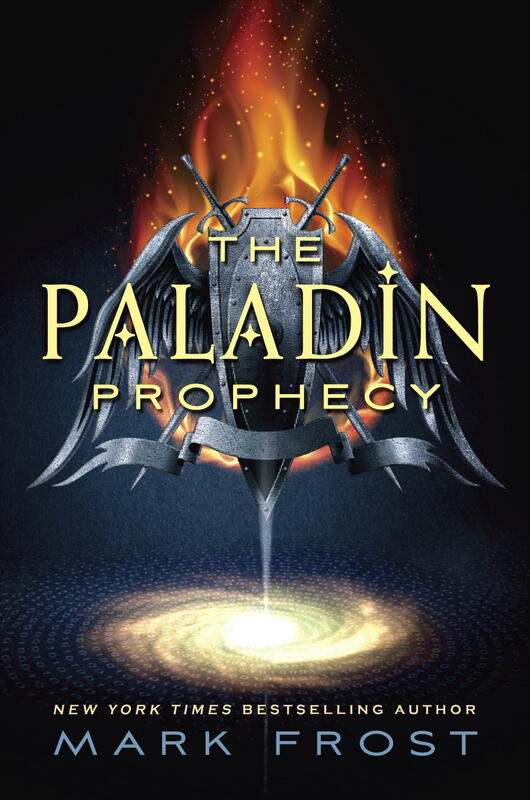 The story builds to a crescendo as the discovery of the Paladins forces everyone’s talents to be put to test. I hadn’t planned on enjoying the book so much but I did. DAD’S LIST OF RULES TO LIVE BY, sprinkled throughout the book and written in long form at the end are interesting. The book has technology, dark forces, human emotions that seem genuine, and lots of action. Love the ‘bugs’ – they aren’t so nice though. And I love the reference to Charlemagne and his Paladins. Looking forward to the next book in the series. Mark Frost, author, has written for tv and movies (Twin Peaks, Fantastic Four) and a best-selling author of 8 other books. He’s turned his talent towards the lucrative and rewarding business of ‘ready teens’. Lucky him. Lucky teens. Andy & Veronica Fish return to two Cape Libraries to bring their expertise and comic/manga/graphic ‘sass’ to you! Ages 11 and up. No fee thanks to Friends of the Library. Paper & pencils provided or bring your own. This is going to be fun! POETRY WORKSHOP @SPL WITH CHRISTINE RATHBUN ERNST!!!! Don’t miss it, Poets known and unknown…..
Poets, ‘Tis time again…. calling all inner and outer TEEN POETS. 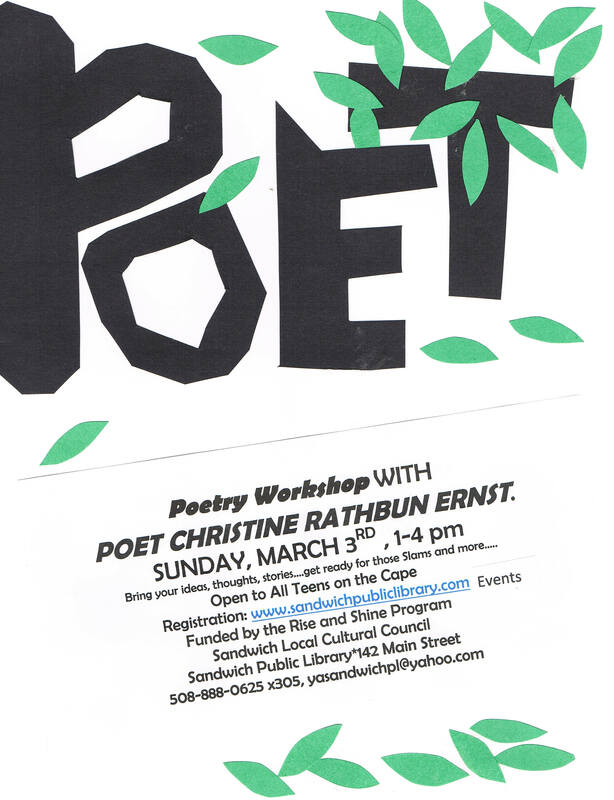 Christine Rathbun Ernst will be running a workshop to build poetry muscle and attitude. 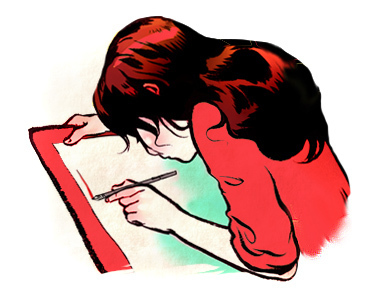 Bring your story, your thoughts and ideas (along with friends who write….) and come away with some fine words. There is no cost to the workshop (sponsored by the Rise and Shine Program). Paper, pencils, food for thought and mind provided. Please register. POETRY SLAMMIN’ TIME IS COMING UP…..